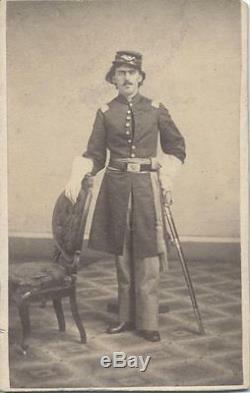 PORTRAIT CIVIL WAR CAPTAIN BENJAMIN RICKER IN UNIFORM -ORIGINAL ERA CDV. PORTRAIT CIVIL WAR CAPTAIN BENJAMIN RICKER IN UNIFORM -ORIGINAL ERA CDV THIS ORIGINAL CIVIL WAR ERA CDV MEASURES 4 INCHES BY 2.5 INCHES. HANDWRITTEN ON THE BACK: CAPT. BENJAMIN RICKER SON OF E.
RICKER PICTURED IS CAPTAIN RICKER IN UNIFORM STANDING IN A STUDIO AND SLIGHTLY LEANING AGAINST A CHAIR. HE IS IN FULL UNIOFMR WITH HAT, GLOVES, AND SWORD. THE BASE OF A POSING STAND CAN BE SEEN AT HIS FEET. WITH THE EXCEPTION OF SLIGHTLY FADING AND A FEW VERY, VERY MINOR AGE SPOTS, THE PHOTOGRAPH IS IN EXCELLENT COSMETIC CONDITION. PORTRAIT CIVIL WAR CAPTAIN BENJAMIN RICKER IN UNIFORM -ORIGINAL ERA CDV (BJI00132). PLEASE REQUEST AN INVOICE BEFORE PAYING. "AS IS" items are not returnable unless they do not match the item description. "AS IS" items are NOT warranted to be operational or functional. We do not mark merchandise values below value or mark items as "gifts" - US and International government regulations prohibit such behavior. The item "PORTRAIT CIVIL WAR CAPTAIN BENJAMIN RICKER IN UNIFORM -ORIGINAL ERA CDV" is in sale since Wednesday, February 26, 2014. This item is in the category "Collectibles\Photographic Images\Vintage & Antique (Pre-1940)\CDVs".images" and is located in Pittsburgh, Pennsylvania. This item can be shipped worldwide.